Elected Democrats and their party propaganda wing, the “establishment media,” have portrayed the thousands of mostly Central American migrants traipsing towards the United States as harmless, poor individuals escaping violence and political persecution in their home countries. No doubt that most of them are poor, but there are questions about whether they’re really being persecuted, whether they’re really in danger, and whether many of them are who they say they are. Over the weekend, Fox News reporter Griff Jenkins, who is traveling with one of the caravans, interviewed a man called “Jose” who says he wants to come to the U.S. Actually, he said he wants to get back into the United States. He’s been deported before, so that makes him a criminal already. But that’s not all. Jose is wanted for attempted murder – in his words, a third-degree felony. He says he wants to come back into the U.S. to seek a “pardon,” but the chances of that happening are about as remote as the chances of Barack Obama admitting his was the most corrupt administration in U.S. history. Investigative journalist Sara A. Carter, who has traveled to Central America to interview Guatemalan, Honduran, and Mexican leaders and officials regarding the migrants, reported, “Guatemalan intelligence discovered people from India, Bangladesh, [and] Africa had also joined in with the caravan. I bumped into a number of young MS-13 gang members,” she tweeted, according to AMI Newswire. 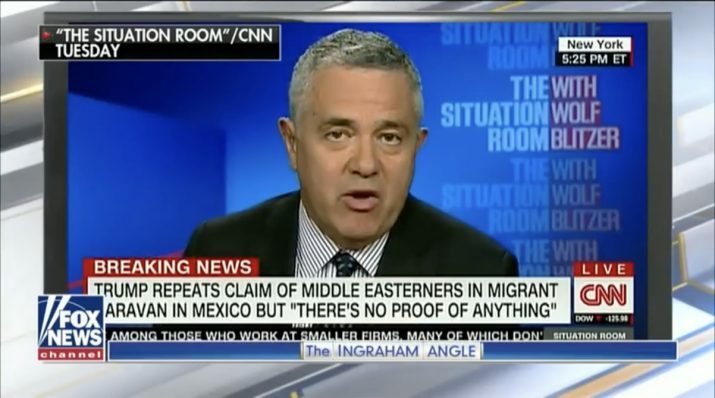 POTUS Donald Trump tweeted last week that people from the Middle East were among those traveling with the caravan, but the disgustingly dishonest American media refused to report it and instead questioned the president’s truthfulness (because he’s a bigot and hates people from Muslim countries, don’t you know). They were, however, quick to report that he said last week he had “no proof of anything” regarding who was actually traveling within the caravan, though he said he had “very good information” about it – which, to a president, means hard-core intelligence. Turns out he was right. Again. Guatemalan President Jimmy Morales told American reporters that his country has detained roughly 100 terrorism suspects, some of whom were ISIS members. Morales reportedly made the comments during a speech at a conference in Washington D.C. over the weekend. “[W]e have not only detained [terrorists] within our territory, but they have been deported to their country of origin,” Morales said in reference to his efforts since taking office in 2016. There is no bigger ‘criminal’ and threat to the U.S. than a terrorist. And there’s no better way to infiltrate our country than by blending in with a mass of humanity across open borders. But their efforts are not likely to be successful. Department of Homeland Security Secretary Kirstjen Nelson said Sunday that the migrants aren’t going to be allowed into the country so the best thing they could do is turn around and go home or accept Mexico’s offer of asylum (which hundreds have done). The Trump administration is serious about preventing the migrants from entering. Reports last week said the Pentagon was sending 800 active duty Army soldiers to the border to help bolster security along with Border Patrol and about 2,100 National Guard troops. Troop strength, however, has been increased to 5,000. Read more about the migrant invasion of the U.S. at InvasionUSA.news. Show us your support by liking our page!